SCARY HORROR STUFF: HORRIFIED: A New Reality Game Show Series COMING SOON! BE AFRAID. HORRIFIED: A New Reality Game Show Series COMING SOON! BE AFRAID. Someone shoot me, please. Can't be for real. Oh, but it is. And I had to have been hiding in a horrendous hole to not see this at all; however, I can forgive myself the grievous sin given it seems that this project hasn't actually been set in stone, yet. I can't even find the casting call for it, yet (someone help me here with it!). 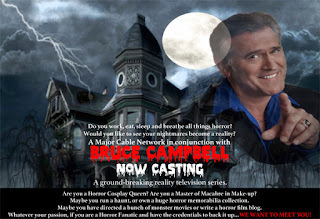 A reality "game show" celebrating the horror genre. Fun. Insanely fun. And truly an homage to everything horror especially along the theme that was so prevalent on TBS with KING OF THE NERDS, sadly departing after only three seasons. That's okay, because there was, in fact, talk about a reality game show type project called HORRIFIED, featuring cast members staying at a "haunted-type house" and participating in all sorts of crazy tasks related to the genre. Think SURVIVOR meets EVIL DEAD and THE REAL WORLD with a pinch of arsenic, and you get the picture. And It Turns Out the Project Now Has a Network for Production! Word is the casting call deadline is February 1, 2017, with filming starting in July and ending in August. Pitman Casting has issued out the casting call, looking for horror aficionados, bloggers, cosplay queens/kings, and so on and so forth. The idea is quite the spectacle. So maybe I should continue looking for this casting call? What do you think? YAY? Or NAY?